The From Mao to Now exhibition at Sydney Olympic Park was opened by the NSW Minister for the Arts and Sydney Olympic Park, the Honorable Frank Sartor on June 28. Over 390 people gathered to celebrate this comprehensive survey show of Australian/Chinese art. Featuring the work of 80 of Australia’s most renowned Chinese Australian artists and artists who have worked in China, including representatives of 1st, 2nd and 3rd generation Chinese Australians, those who moved to Australia after 1989 and a number of exciting works by new and emerging artists. Sydney Olympic Park Authority is pleased to announce From Mao to Now – Chinese sport and propaganda posters and contemporary artists’ responses to modern China. Commencing on Saturday 28th June and running every weekend until 28th September, this program combines two visual arts exhibitions with interactive cultural workshops and will run in the lead-up to, during and following the Beijing 2008 Olympic Games. Sydney Olympic Park has retained Catherine Croll to manage and curate the program. Catherine is a respected practitioner in the areas of Community Cultural Development (CCD) and Cultural Planning, and is skilled at sharing her practical knowledge with others through her work as a facilitator, trainer and lecturer. In 2007, she spent 7 months travelling 40,000km solo across mainland China and Tibet by bus, train and ferry to create a portfolio of photographs which captures a country and people in a period of rapid change. Her self published little red book, entitled ‘China – A Portrait’, contains images of colorful, ever-changing diversity: from the bird markets of Kowloon to dust towns strung along the Old Silk Road; from isolated minorities clinging to their timeless ways in the back blocks of Yunnan to the frantic commercial dynamism of Shanghai; and from the bustling Hutongs of Beijing to the serenity of the Tibetan plateau monasteries. The From Mao to Now exhibition will feature Chinese sports and propaganda posters from the Mao era previously unseen in Australia, together with contemporary responses to China produced by artists who have recently worked there. As well, noted Chinese-Australian paper cut artist, Pamela See, will present a series of school holiday workshops enabling visitors to explore and experiment with traditional Chinese artforms including calligraphy and papercutting. From Mao to Now will be held from 28th June until 28th September 2008 (weekends only, 10am to 4pm) at the Armory Gallery, Newington Armory, Sydney Olympic Park. The school holiday workshop program will run at the same venue everyday from 12th July to 20th July inclusive. More information regarding From Mao to Now can be obtained by contacting Catherine Croll directly via mobile +61 419 427 002 or email. 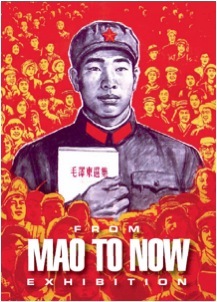 I am interested in submitting work for “From Mao to Now” exhibition. I have works underway influenced from my appreciation and love of the Chinese culture . Catherine, I read a blurb on ‘Mao to now’ only today. I have a couple of works that may be suitable. I’d like to know more. Thanks, Jen. Great to hear from you. Sounds really interesting – please send info on applications, guidelines etc.